Daylilies (Hemerocallis spp.) are members of the Liliaceae family. This lovely perennial comes in a wide variety of colors and is a popular choice among home gardeners. 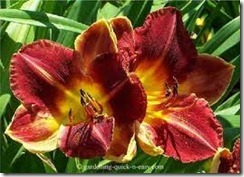 Handling or ingesting daylilies will not result in toxic effects in humans. According to North Carolina State University Extension, daylilies are often used as edible decorations on cakes and deserts. While this plant does not produce poisoning symptoms, it should be consumed in moderation as it may cause diarrhea and excessive urination. Daylilies have toxic effects on some animals. The American Society for the Prevention of Cruelty to Animals states that while the daylily does not produce plant poisoning symptoms in dogs, it can be serious if consumed by other animals. Cats that ingest this plant can suffer from kidney failure and cows often develop paresis, a loss of coordination, blindness and even death. While the daylily may not cause humans to suffer from plant poisoning, ingesting any type of plant material can cause adverse effects such as allergic reactions. Plants are often sprayed with pesticides, which can produce undesirable symptoms as well. Any human or animal that experiences unusual symptoms after the ingestion or handling of daylilies should consult a doctor of veterinarian for proper diagnosis.